Is Your Adult Acne caused by Your Skincare or Makeup? Acne that is caused by skincare, make up or hair products is called Acne cosmetica. In our previous post we looked at adult acne and hormones, covering how hormonal imbalance can lead to the frustrating and self-confidence sabotaging condition known as adult acne. In this post we’ll explore how your skin care routine and products you’re using every day could be worsening or even causing your acne and problem skin. Acne Cosmetica is a term that was coined in the early 70’s by dermatologists to describe a type of acne seen in women in their 20’s and 30’s caused by skincare, haircare and makeup products. When the offending products are removed, acne cosmetica usually clears up after a few weeks. It’s typically appears as small hard bumps and mild whiteheads worse on the cheeks and forehead but can also be rash like and itchy. If the aggravating products aren’t discontinued, the condition continues indefinitely. Around the same time the term ‘comedogenic’ and ‘non comedogenic’ were also developed. These terms, used to describe whether a product contains ingredients that block pores and cause pimples – have been proven to be misleading and meaningless in more recent years, but are still widely used in the marketing of skin care products, particularly those aimed at acne sufferers. Now stop and think about how skincare and cosmetic use has changed in the 45 years or so since it was first noticed that these products can and do cause acne in some women. Whilst the 70’s have a reputation for flamboyant and over the top make up, women and young girls today are applying a lot more product and therefore chemicals to their skin on a daily basis. We’re also using more products that contain alpha and beta hydroxy acid, lactic acid and other ingredients designed to chemically exfoliate skin which are wonderful when used correctly but inflaming and irritating when overused or used incorrectly. You’re probably also using a sunscreen or a moisturiser that contains chemical sunscreens – even when you’re spending the majority of your day in an office away from sunlight and these chemical sunscreens break down, degrade and are ineffective a few hours after being applied but have a high risk of skin irritation (and other more serious health problems are also linked to them). Acne cosmetica is as likely to be triggered by skincare ingredients that irritate and inflame your skin as well as those that block your pores and congest your skin. How do make-up and moisturisers cause acne? Skincare products and make-up can trigger acne, not by blocking pores – but by causing inflammation in your skin. Anything that causes inflammation, be it bacteria, make-up or moisturiser, can trigger acne. The inflammation could be in response to an underlying allergy to one or more of the ingredients in the products you’re using, or caused by chemicals found in your make-up, cleanser, sunscreen or moisturiser, which can be damaging the protective barrier of your skin. Using steroid creams on your face increases the risk of your skin reacting to chemicals in skin care products. Stress, lack of sleep and too much alcohol can also inhibit the immune system in your skin and make it more susceptible to developing an allergic reaction or becoming inflamed from skin care products. And let’s face it, ( so to speak ! ) unless you’ve already made the switch to natural or organic skin care, then the products that you’re using every day are probably choc full of nasty chemicals that are irritating and inflaming your skin. Your skin is a breathing and functional organ, it’s not OK to put ingredients on it that we would never dream of eating. The list of these chemicals is huge and includes phthalates, parabens, sulphates, triclosan, synthetic colours, fragrances, formaldehyde, toluene and chemical absorbers in sunscreen such as benzophenone, PABA, avobenzone, homosalate and ethoxycinnmate. Now this is just the tiniest list of chemicals lurking away in your moisturiser, cleanser, sunscreen, shampoo, foundation and concealer. Some of these chemicals are seriously nasty with studies linking them to breast cancer, fertility problems, ADHD and developmental problems in our skin as well as adult acne. You’re going to be doing your skin and your health a great big favour by switching to natural and organic skincare and avoiding these dangerous chemicals. The Environmental Working Groups, Skin Deep Database has extensive and comprehensive information on the dangers of the literally thousands of chemicals that you’re exposed to every single day via your skincare and personal care choices. When we apply these chemicals to our skin day after day, month after month and year after year there are going to be consequences at some point. Your lifestyle can speed up and increase the chances of reactions to these chemicals. Stress, lack of sleep, alcohol, air conditioning, heating, dehydration and deficiencies of key skin nutrients such as zinc, degrade the protective barriers of your skin and depress your skin’s immune system and ability to heal. Like many acne triggers, the role of silicones in primers, moisturisers and make-up is controversial, but many women find their skin is much healthier and happier when they steer clear of silicones. Silicones such as dimethicone are a cheap way to give skincare products a lovely slippery and smooth feel on your skin. Despite the luxurious feel they give to products, the keyword here is that they are a very ‘cheap’ ingredient and they impart zero benefits to your skin. Their light reflecting properties have made them the darling of primers and ‘anti-aging’ makeup. So why are silicones bad news for healthy skin? When you slather silicones over your entire face, layering them up in your moisturiser, primer and foundation, you’re also trapping bacteria, dead skin cells and sweat, up against your skin. The result can be dull, congested and inflamed skin. Inflammation in your skin can be a trigger for acne as well as flaky and sensitive skin. Many silicones such as dimethicone are also really difficult to remove, especially if your cleansing routine at night is a bit slap dash. Think of how lank and greasy your hair feels if you put too much anti frizz serum on – and how hard it is to wash out. Hair serums are very high in silicones due to their ability to reflect light and impart a smooth, shiny look without adding weight to hair. If you have sensitive and acne prone skin as an adult, silicones are worth removing completely for at least three months. Look for ingredients that end in ‘cone’, ‘siloxane’, ‘col’ or contain ‘poly’. 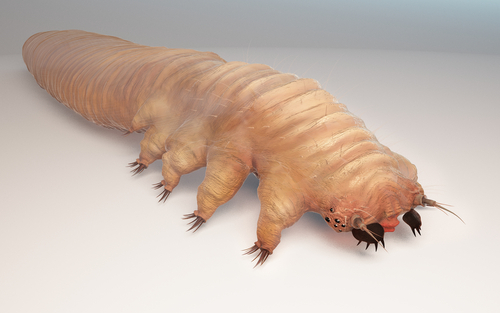 Is your night cream feeding Demodex mite? 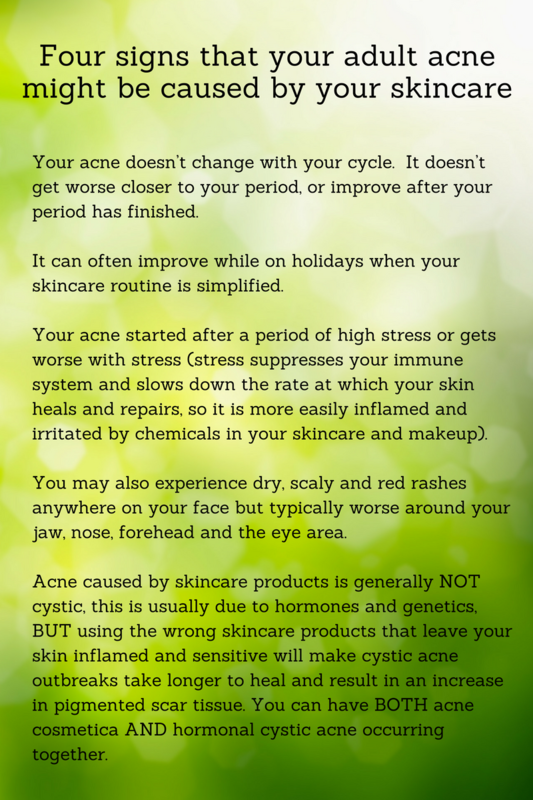 In our last post on hormonal adult acne we looked briefly at how acne promoting bacteria feed on the excess oil created by hormonal imbalances leading to inflamed skin and acne. You’ll probably be quite horrified to discover that there are other critters that also feed on skin oil – such as the Demodex mite which is associated with both adult acne and rosacea. While many people have this common mite living happily on their skin, Demodex tends to cause problems when your immune system is suppressed and a few mites turns into an infestation. What causes your immune system to become suppressed? Lack of sleep, stress, nutrient deficiencies, too much sun and too much sugar and alcohol. Like bacteria associated with acne, these mites cause inflammation in your skin and anything that causes inflammation can trigger acne Demodex mites feed on oil, they’re not fussy, any oil will do. Cleaning your skin well before bed is essential, as is staying away from heavy or oil based night creams and instead using a water based serum. Other signs that Demodex might be causing your acne include: itchy skin, scaly skin, redness, sensitive skin, a burning sensation and skin that feels rough and sandpaper like. One of our underpinning skin care philosophies at Sage Beauty is to only use water based serums on the skin at night time rather than heavy oil based night creams that are popular with many skin care lines. Not only can oil based night creams feed microbes such as Demodex, they also interfere with your skins natural detoxification and healing rhythms that occur at night while you’re sleeping. Other bacteria that can trigger acne breakouts by causing inflammation can be found living in your makeup sponges and brushes. These bacteria can irritate your skin so that it becomes sensitised to skincare products and makeup that you use on a daily basis. Wash all brushes and sponges regularly and never share them with anyone else. There are no hard and fast rules as to which chemicals or ingredients in your skincare or make-up are affecting your skin. The more synthetic chemicals there are in a product the more likely you are to react as they damage, irritate and inflame your skin. Price doesn’t mean anything, many high end products contain just as many skin inflaming ingredients as supermarket brands. Also, the more stressed and sleep deprived you are, the risk that your skin is going to react to an ingredient increases significantly. Many women find their adult acne starts or becomes much worse after a major life stress – a divorce, leaving a highly stressful job, moving countries or even having a baby! If you suspect that your skincare products might be giving you acne you need to focus on healing your skin by switching to products for sensitive skin – anti acne products won’t work and may actually make your skin worse. Once you find and remove the culprit you’ll have clear and happy skin within a few months. 1. Take your skincare back to basics. Invest in a cleanser, moisturiser and serum designed for stressed, inflamed and damaged skin. While it’s usually OK to mix your skincare up and use products from different ranges, when your skin is stressed (and if you’re suffering adult acne then your skin is stressed) you should stick to the same range for at least 3-6 months. Products within the same range are usually designed to work synergistically. 2. If you can afford it, replace all your make up brushes, sponges and easily contaminated make up items such as mascara. If this isn’t an option then you need to thoroughly sterilise and clean them, repeat this process every month until your skin is healed. Soak all brushes and sponges in an antibacterial solution for the recommended amount of time (we use and recommend Tri Nature Sphagnum Moss, an all-natural hospital grade disinfectant). Then use hot water and dishwashing liquid to clean them. Rinse well and then let them dry thoroughly before use. Ideally allow them to spend several hours drying in direct sunlight. Wipe all pressed powders, eyeshadows, lipsticks, eyeliners and eye pencils well with chemical free baby wipes then set them in direct sunlight for a few hours. 3. Don’t wash your face directly under the water in the shower. Use a gentle cleanser and either a muslin face compress or face washer to gently compress and cleanse your skin using warm water morning and evening, in the basin. Muslin face compresses are preferred as they will dry completely when hung out correctly preventing the growth of bacteria. If you’re using a regular face cloth, be sure to hang it out and not leave it scrunched up in a wet heap in the sink, allowing bacteria and mould to flourish. Change your face washer every second day. Muslin cleansing cloths can be used for 3-5 days before washing. We sell organic muslin face cleansing cloths that help to exfoliate as you cleanse and can be simply thrown in the washing machine any time with your clothes and is dry in just a few hours. 4. A good exfoliating and cleansing facial can be a good way to start the healing process in your skin. Facials such as Eminence Fire and Ice facials stimulate circulation to the skin, exfoliating as well as moisturising and calming stressed skin. MV Organic Facials are also wonderful for inflamed congested skin as the high quality pure essential oils help soothe and heal the skin in the gentlest possible way. And if you love massage with your facial – this is heaven. Dr Hauschka Cleansing or Revitalising Facials are also wonderful as they focus on clearing the lymph and gently stimulating the skin’s natural rhythm to balance and heal. Or if you have Rosacea, we have our own special Sage Rosacea Facial using the most calming of ingredients across all of our ranges. So many women with Rosacea think they cannot use anything for fear of a breakout and aggravation, and end up with such dry dehydrated skin as a result. We have simple nourishing products and facials to hydrate and restore your skin, so please do not give up ! You will be so relieved to discover that you can have beautiful radiant skin again ! 5. Wash your face properly every night before bed. Skin damaging microbes such as the Demodex mite feed on oil. This is another reason to choose a water based serum over a rich, oil based night cream. 6. Prioritise sleep and follow an anti-inflammatory skin friendly diet. Drink plenty of water and go easy on the alcohol. Doing a detox is also a great idea to kickstart your skin healing. Skincare and beauty is big business and some brands and manufacturers give used car salesmen a run for their reputation. The industry is aware that the public are slowly but surely switching onto the idea that chemicals in skincare are bad news and are starting to turn to safer natural and organic products. This means that claims of organic and natural are going to sell more products. Let’s just say that not all organic skincare is especially natural or free from suspect chemicals. At Sage Beauty we pride ourselves on being really, really picky when it comes to the quality and integrity of the skincare that we sell and use on ourselves and our clients. If you’re ready to make the switch to safer products to help your adult acne, please speak to us first. Our holistic beauty therapists can help you identify if your skincare or your makeup is causing problems for your skin and can advise you on the best products to use for YOUR skin. We also stock and can guide you on an anti-inflammatory and skin focused, practitioner only, detox program. Can’t get to our North Bondi salon and holistic, organic beauty store? We can do Skype or FaceTime skincare consultations no matter where in Australia or even the world you live. Our naturopaths and holistic beauty therapists can team up and put together an individualised program that addresses the underlying cause of YOUR adult acne. Each comprehensive program covers safe skincare, chemical free makeup, diet, lifestyle and supplements. Call us on 02 9130 7064 or send us an email.